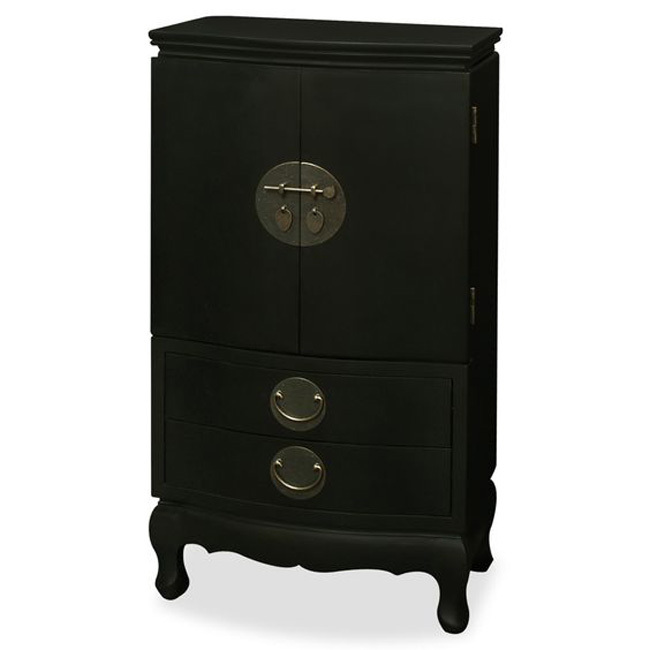 Gorgeous, elegant and attractive, these 25 black jewelry armoires have been carefully selected and gathered in this gallery especially for your eyes! You are invited to take a look at our products and choose the ones that fit your style, taste, budget and jewelry! They come in all sizes, shapes, designs and all of them features chic and striking black colors that will definitely stand out everywhere! These products have been designed so that you will be able to display your jewelry in a much more remarkable and efficient manner and they will definitely do a great and satisfying job! You can always check the Zen store for many more types of jewelry armoires or go straight to our black jewelry armoires category in the store if you’re not in the mood for scrolling through our recommendations. Beautiful and spacious, this chic jewelry armoire features plenty of space and compartments so that your entire collection of beloved jewelry can be accommodated and also elegantly displayed as well! 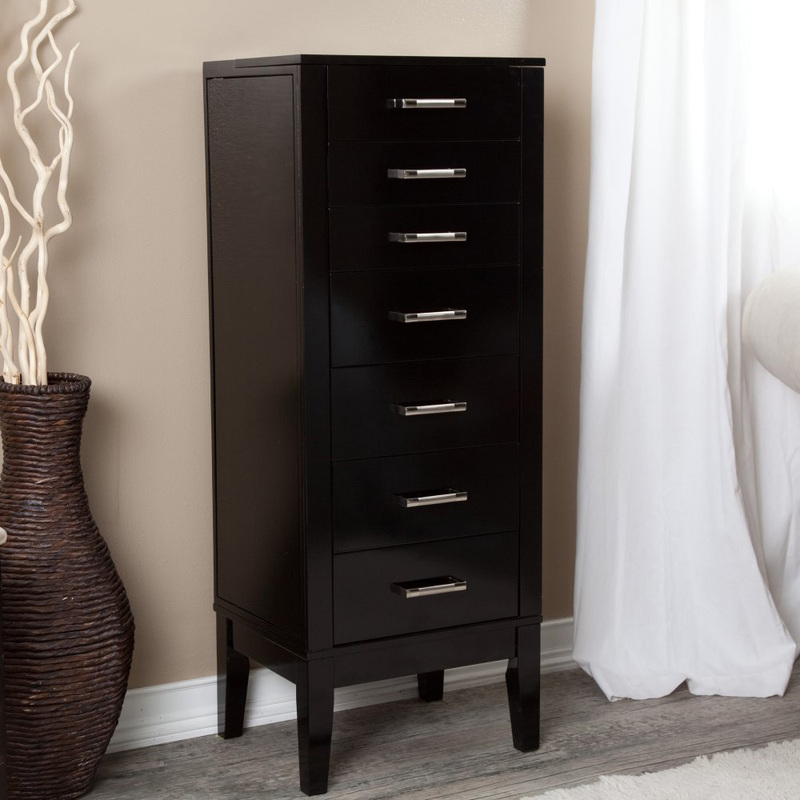 Elegant and finely designed, this armoire is a perfect way of storing the entirety of your jewelry in a way that will allow you to save up plenty of space in your store! 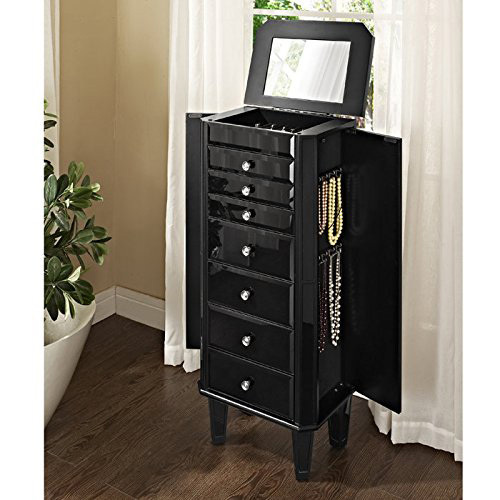 Fancy and fashionable, this gorgeous black colored jewelry armoire features no less than 8 separate drawers and so that it can easily accommodate your entire collection of jewelry without a problem! 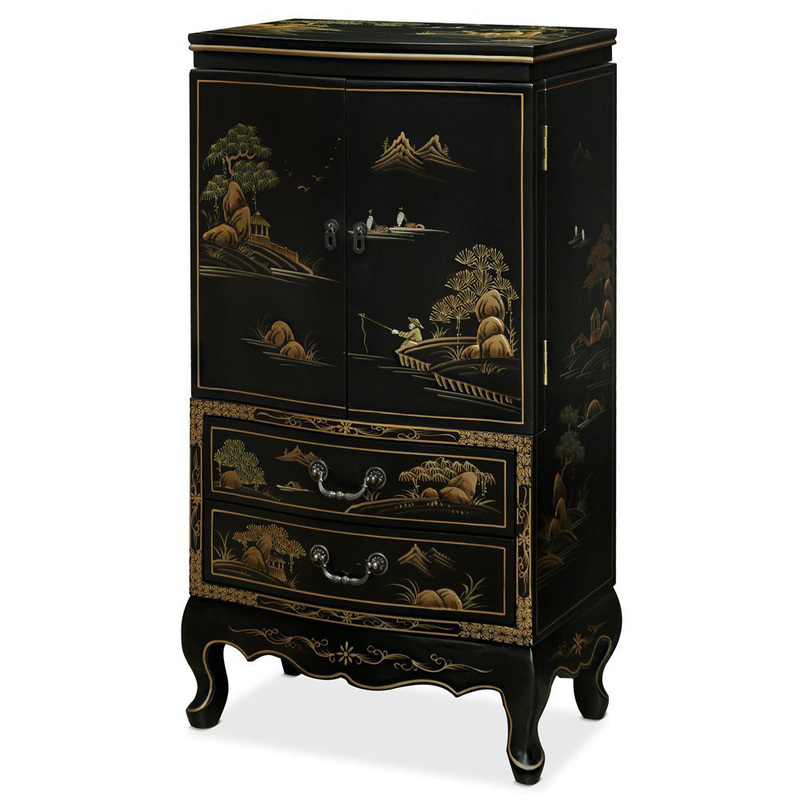 Gorgeous and uniquely designed, this impressive and brilliantly crafted jewelry armoire is sporting a beautiful and remarkable Chinese motif and it is a truly wonderful manner of presenting your jewelry collection! 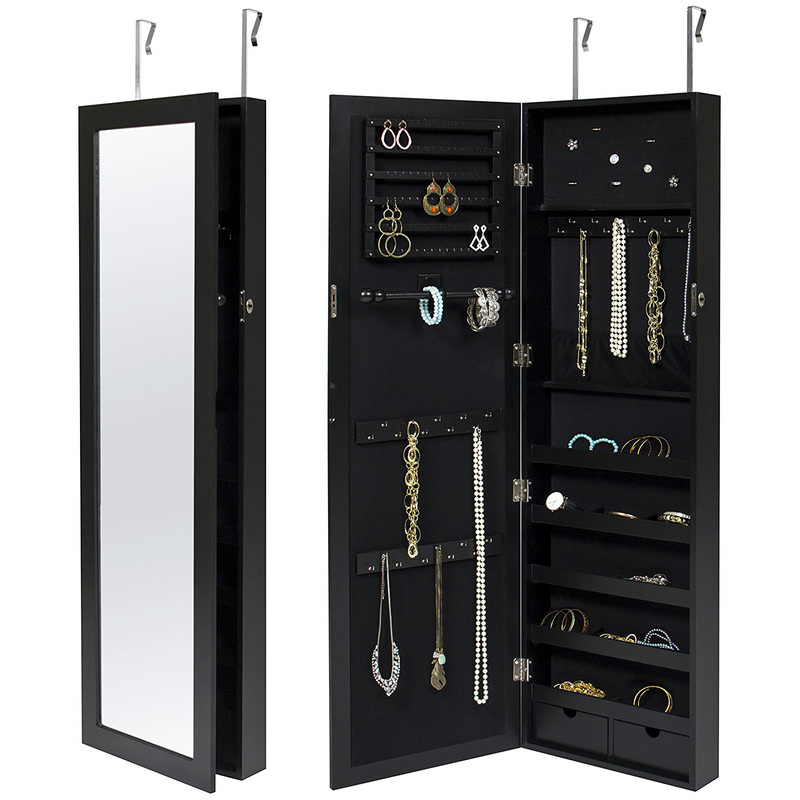 Classy, chic and elegant, this beautifully designed and black colored jewelry armoire is a spacious and intelligently compartmentalized item of jewelry display and it is ideal for storing your entire collection! 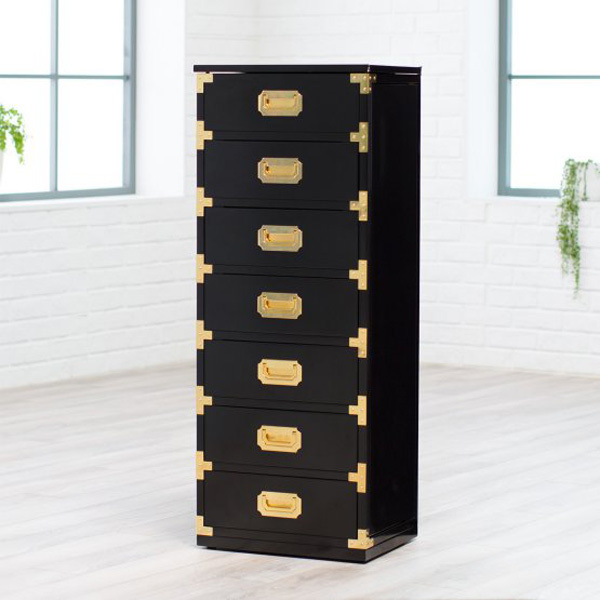 Beautiful, elegant and modern looking, this finely designed and bright black colored armoire offers a spacious and fashionable manner of storing and also exhibiting your entire collection of jewelry products! 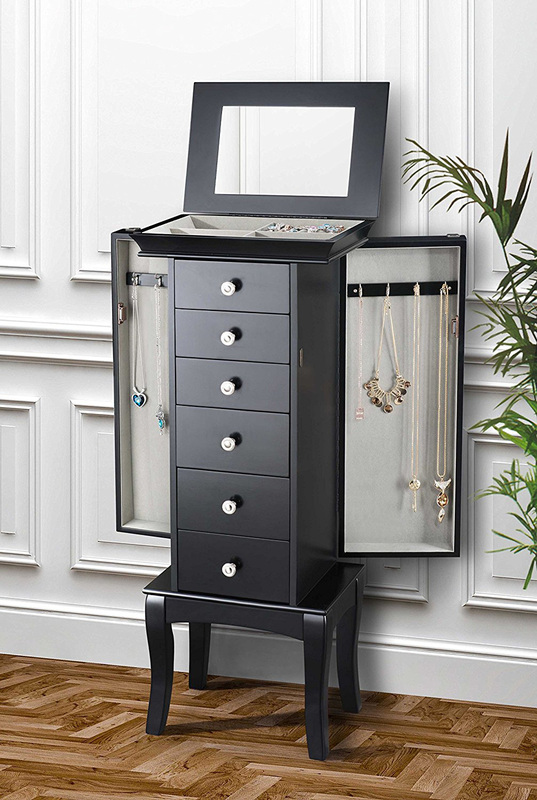 Fashionable and neatly crafted, this chic and gorgeous black jewerly armoire provides a most efficient and elegant manner of sorting, arranging and displaying your collection of beloved jewelry in one single place! 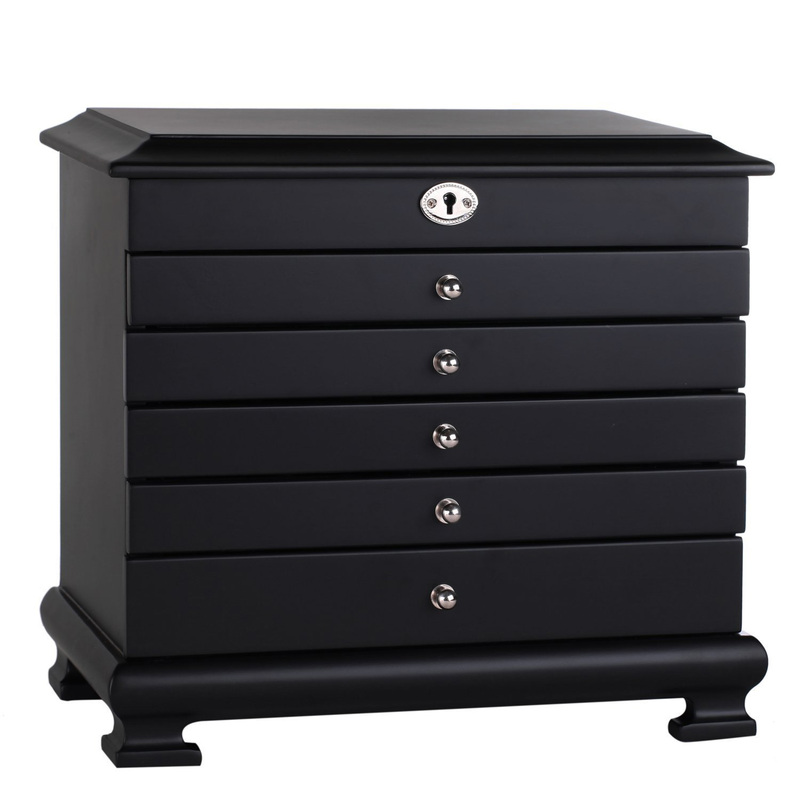 Fancy, and attractive, this armoire is sporting a striking black colored look and it is equipped with plenty of drawers, compartments and ways in which you can easily accommodate your jewelry sets! 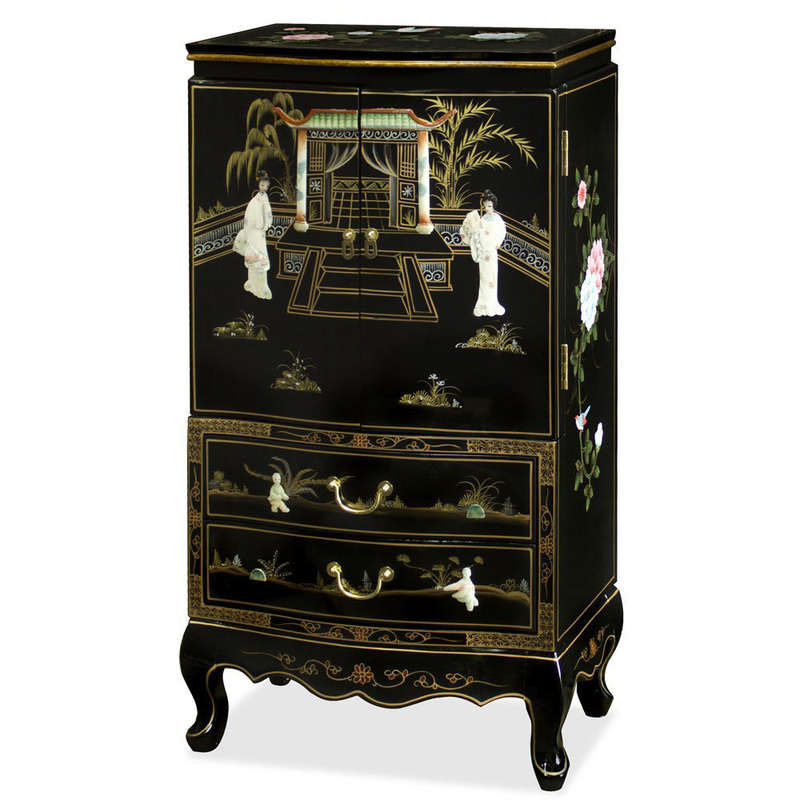 Gorgeous, amazingly designed and authentic, this beautiful jewelry armoire is adorned in an impressive Chinese floral motif and it offers a wonderful and unique way of arranging your jewelry collection. Elegant and fancy, this lovely and rich brown colored wooden armoire offers a sturdy and reliable manner of presenting and storing your beloved collection of jewelry in one single place! 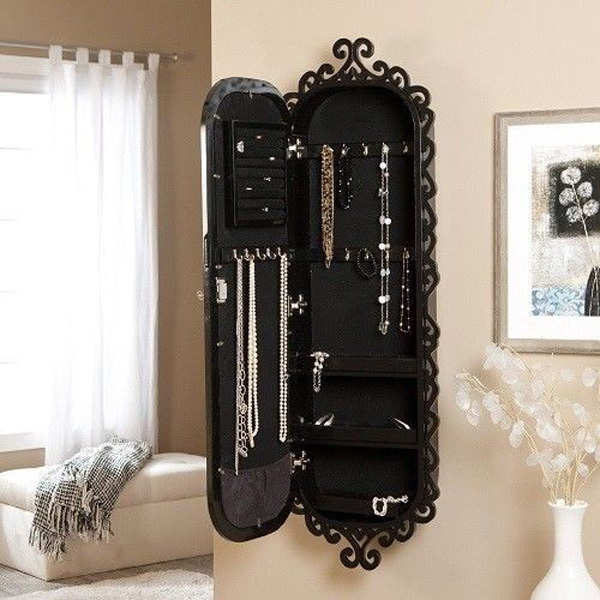 Fashionable and stylish, this lovely product of jewelry display features a chic and attractive look and it will beautifully present and store any kind of item of jewelry without a problem! Beautiful and elegant, this impressively crafted jewelry armoire features plenty of hooks, holes, compartments and so on in order to display and store your jewelry in a more efficient manner! 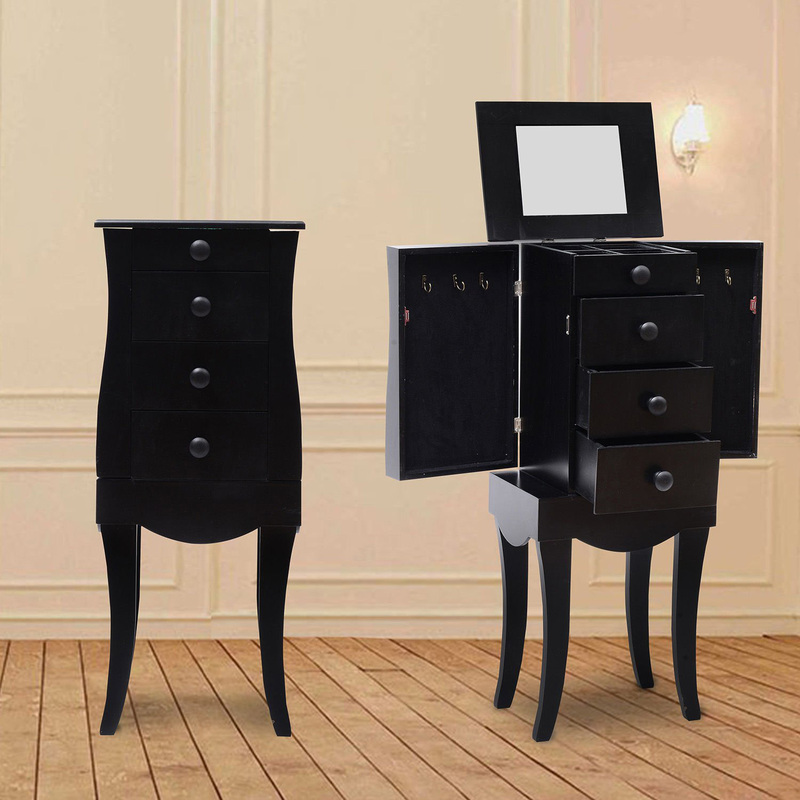 Simplistic yet highly attractive, this beautiful and black colored jewelry armoire is more than perfect for an elegant and fashionable presentation and also a safe storage of your jewelry products. 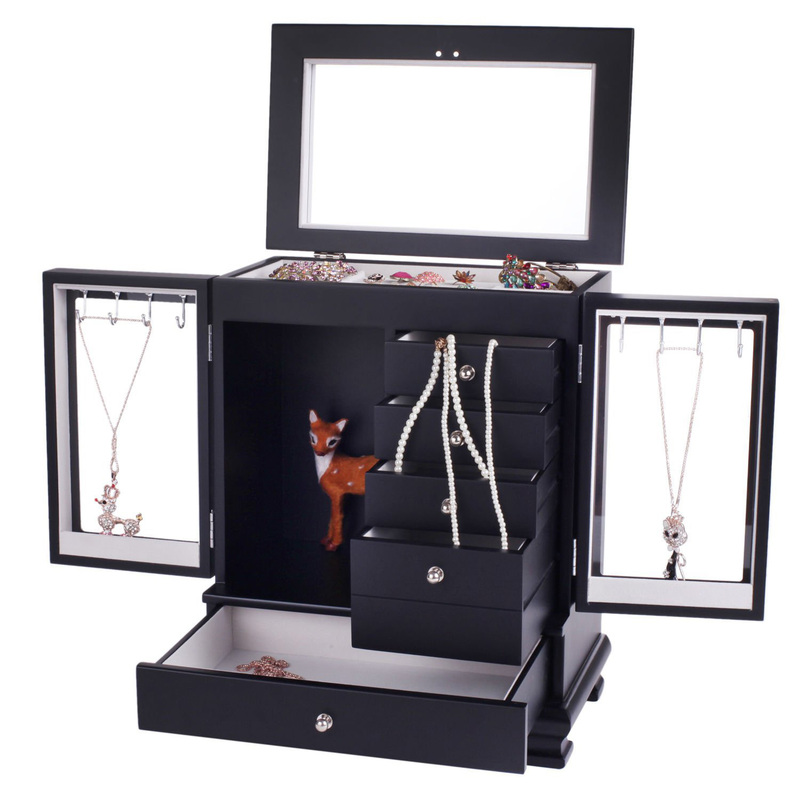 Gorgeous, spacious and attractive, this impressive and remarkable item of jewelry display is a large and beautifully black colored jewelry cabinet that can easily store, arrange and display all sorts of jewelry! 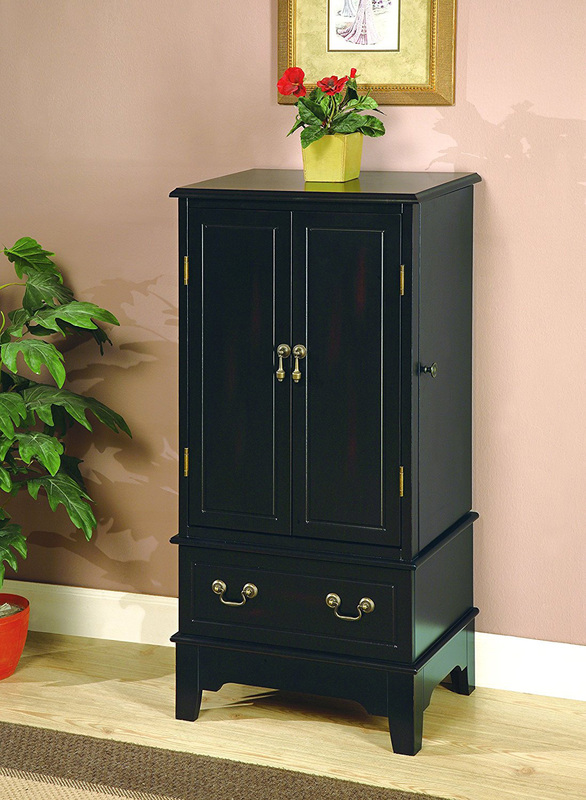 Fancy and elegant, this black colored jewelry armoire is a remarkable way of storing, arranging and displaying all kinds of jewelry in a completely safe and reliable manner as well! 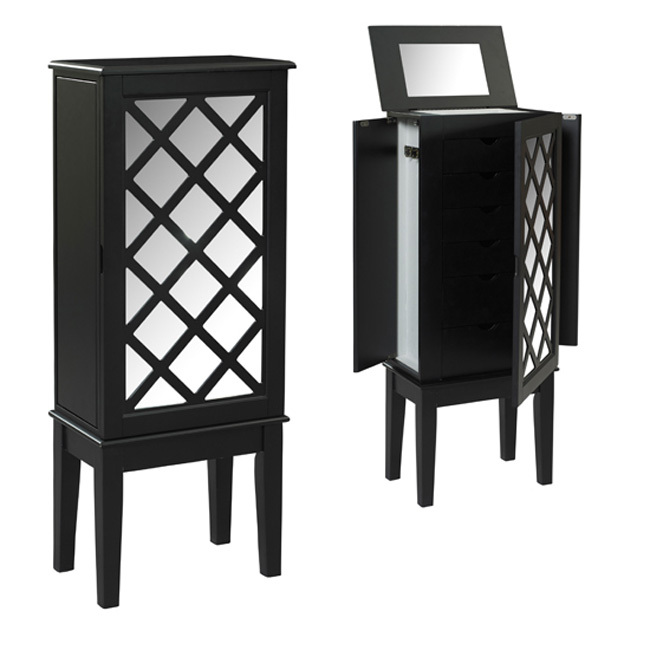 Chic and stylishly crafted, this impressive black and white jewelry armoire offers an elegant and modern looking design that will beautifully store and also display your entire collection of jewelry! 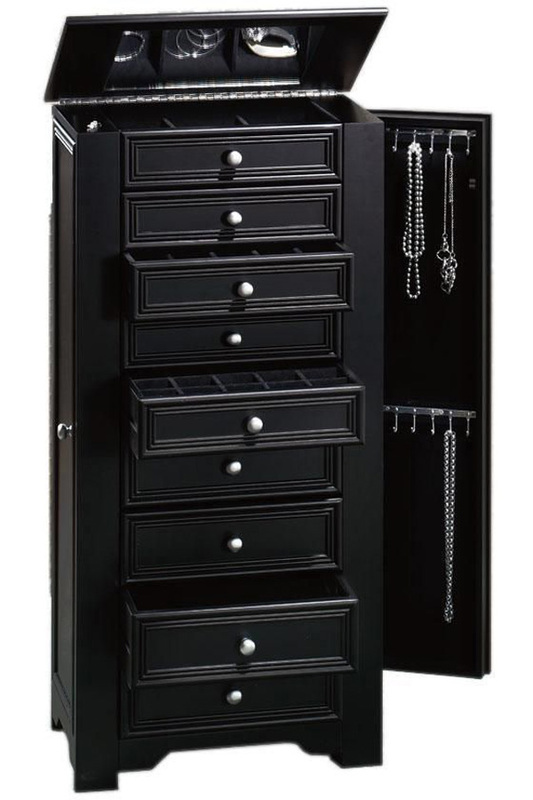 Elegant and strikingly designed, this beautiful and impressive dark colored armoire offers a truly unique and elegant way of storing, accommodating and displaying your entire sets of jewelry in one single place! Gorgeously and amazingly designed, this astonishing piece of craftsmanship offers a truly unique and remarkable manner of exhibiting and also storing your beloved collection of jewelry in one single place! 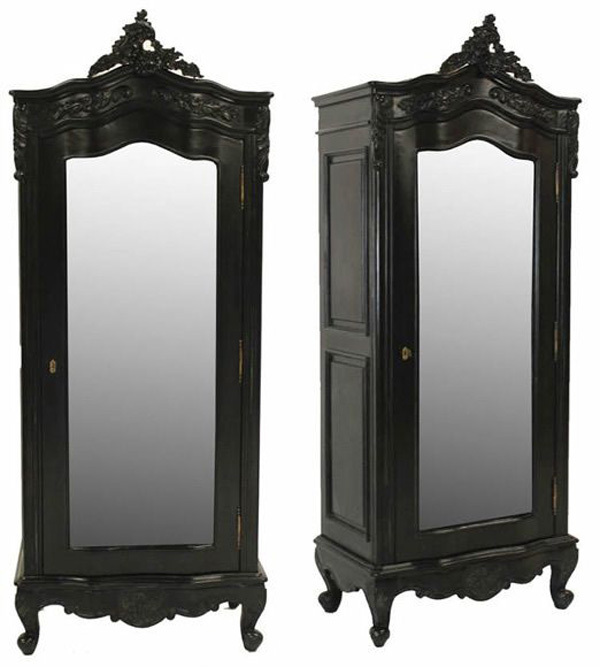 A gothic-toned / noir wooden design that emphasizes a large frontal mirror on this beautiful armoire. 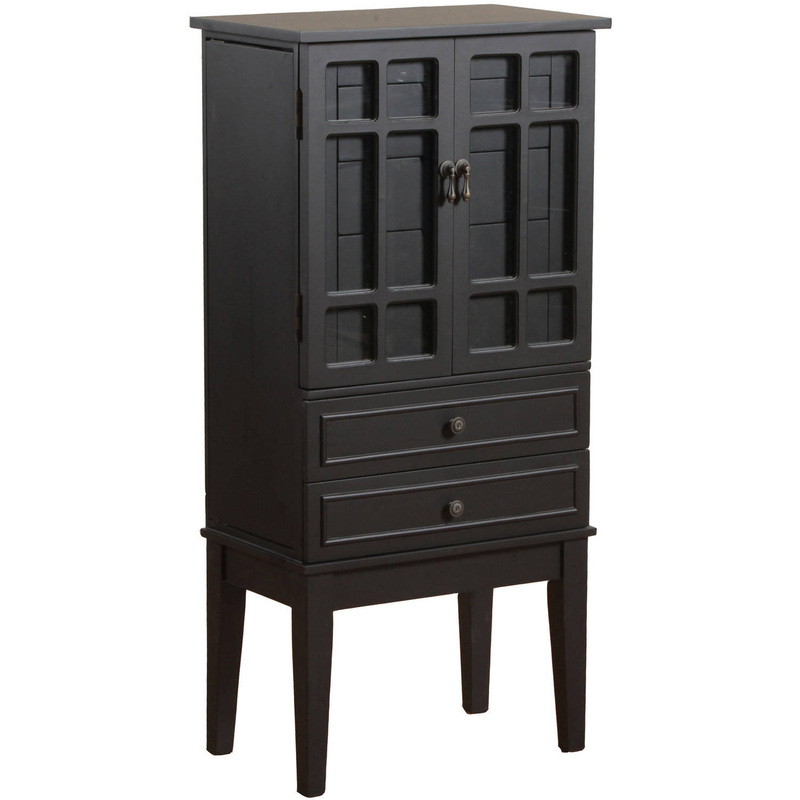 The striking design can turn this armoire into a centerpiece of many rooms. 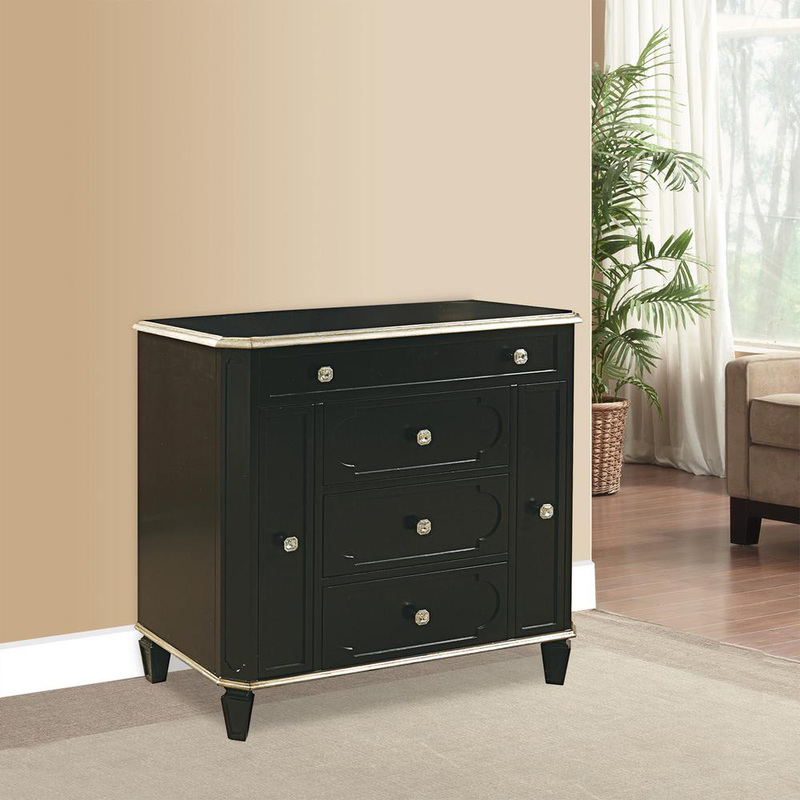 Rich and amazingly crafted, this impressive item of jewelry display is a beautiful black and golden colored armoire that is perfectly suitable for an attractive and elegant presentation of your jewelry. 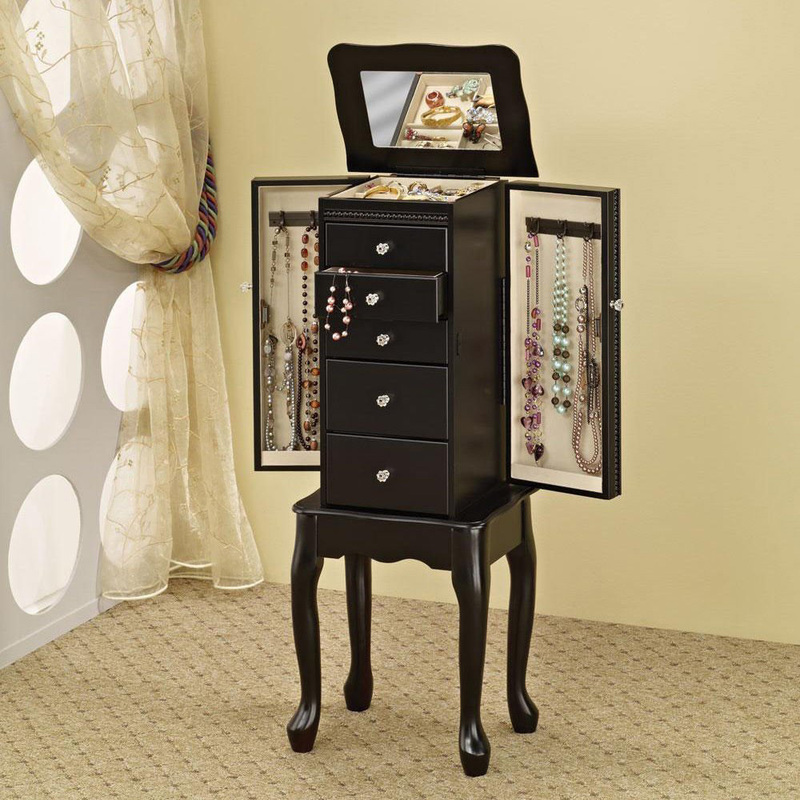 Gorgeous, striking and remarkable, this beautiful and elegant jewelry armoire offers a fashionable and elegant manner of storing, arranging and exhibiting your entire collection of jewelry in one single place! 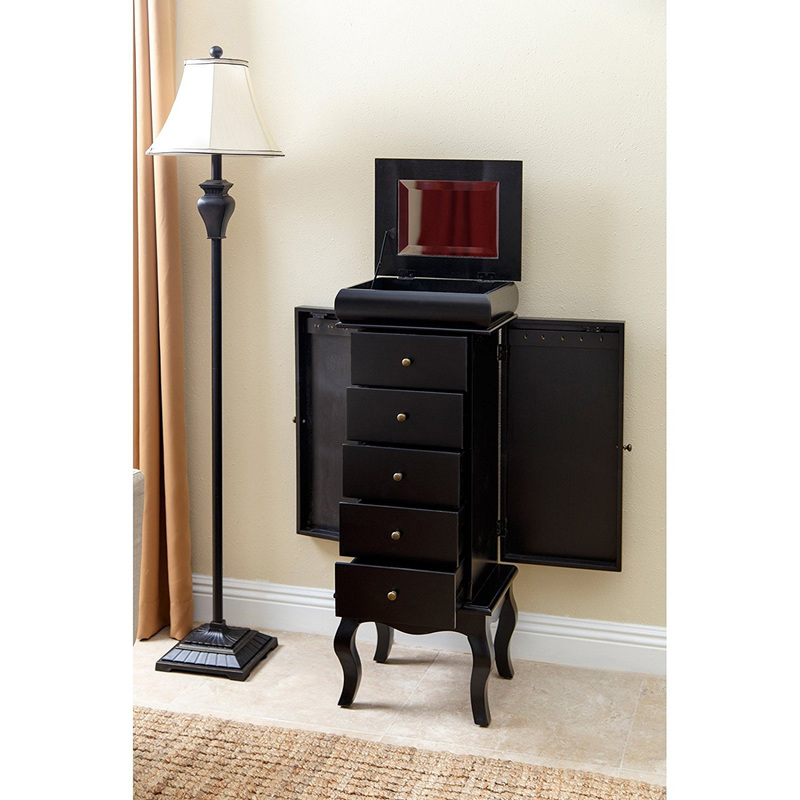 An elegant and fancily designed jewelry armoire, this beautiful black colored product offers a neat and efficient storage and also a beautiful display of all sorts of items of jewelry! 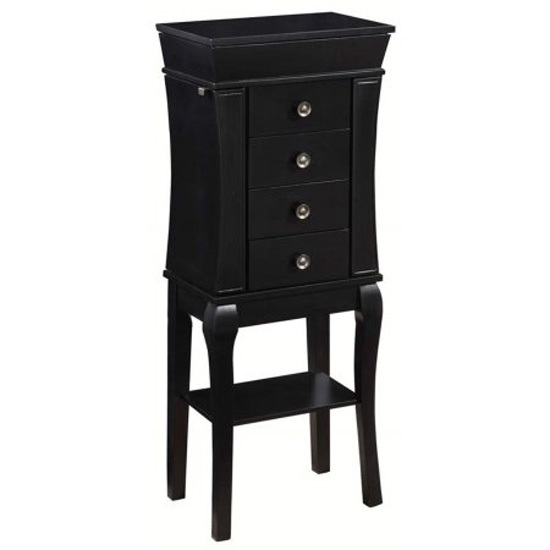 Chic, stylish and attractive, this entirely black colored jewelry armoire is a wonderful modern looking product that will provide a truly beautiful, efficient and professional presentation of your jewelry items. 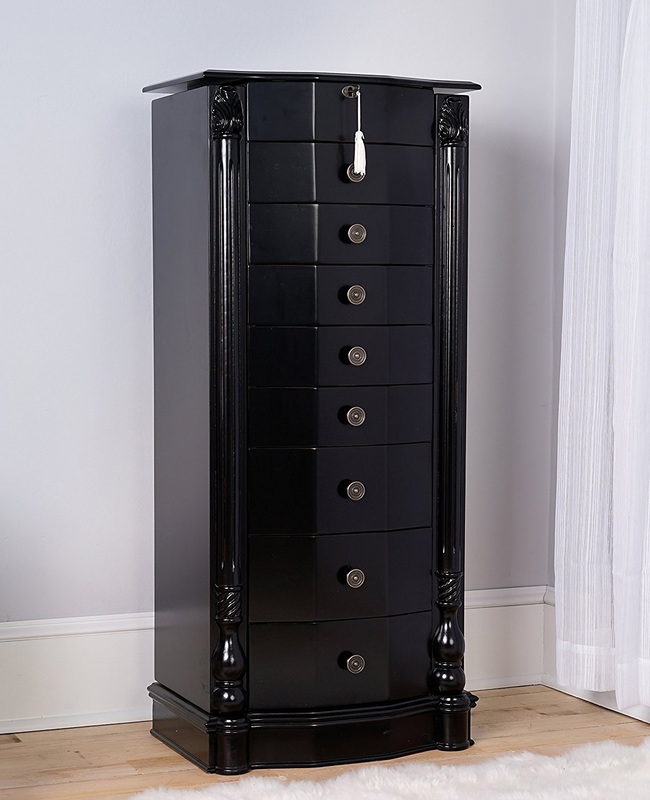 Chic and elegant, this finely carved black colored armoire is one of the most fashionable ways of presenting all of your jewelry products, both in your own home or in the shop! 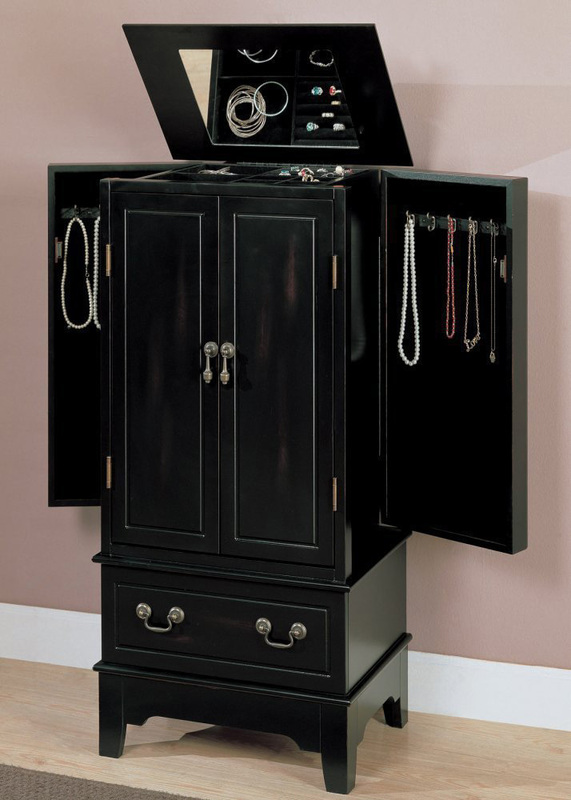 Fancy and fashionable, this beautiful and finely crafted black colored armoire is an elegant and wonderful manner of storing, displaying and also arranging your jewelry products in one single place!